A bizarre geriatric space action drama, Space Cowboys brings together four veterans of the screen and launches them into a ridiculous premise without a parachute. In 1958, base commander Bob Gerson announces that Air Force ace pilots training to join the space program are being replaced by monkeys. The sidelined men include the reckless Colonel William "Hawk" Hawkins and the more circumspect Colonel Frank Corvin, and they never forgive Gerson. In the present day, Gerson (James Cromwell) is a senior administrator working for NASA, and facing a crisis. A Cold War era Soviet communications satellite is malfunctioning and dropping to Earth. Its now-obsolete navigation system was designed by Corvin (Clint Eastwood). Gerson reluctantly agrees with Corvin's plan to reassemble his crew, consisting of Hawk (Tommy Lee Jones), Captain Jerry O'Neill (Donald Sutherland) and Captain "Tank" Sullivan (James Garner) and embark on a space shuttle mission to fix the satellite. The four elderly men undergo a compressed one month training program, and are joined by young astronauts Ethan (Loren Dean) and Roger (Courtney B. Vance). Hawk starts a romance with NASA scientist Sara Holland (Marcia Gay Harden). Finally the six men take off and rendezvous with the stricken satellite, and find more than they bargained for. Sloppily directed by Eastwood, Space Cowboys does offer the enjoyment of watching four classic actors having some fun, and features some decent spacey cinematography in its final half hour. But otherwise the movie fails in almost all aspects. Even after allowing for the high concept of four old men being entrusted with a critical space mission, the film never finds a groove. It cannot be taken seriously although it appears to want to be, it's not funny or tongue in cheek enough, the science is preposterous, the romance unbelievable, the pacing stodgy and the action limp. The plot surprise, if that is what it was, is repeatedly telegraphed light years in advance, and only serves to make the film's fundamental premise more absurd. As a minimum the one aspect that the film should have made work is an engaging dynamic between the four men, but the script again fails to deliver. 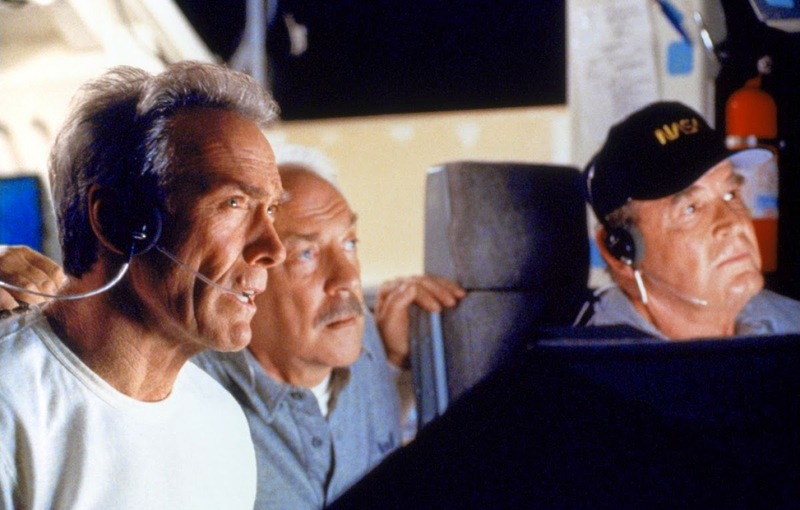 Sutherland and Garner are effectively reduced to back row spectators, and the tension between the characters of Eastwood and Jones is established in the first scene and barely evolved. With more careful treatment Space Cowboys may have had some interesting things to say about second chances, the wisdom of veterans, never giving up on far-fetched dreams, and old astronauts as celebrities. But with the good ideas squandered into so much space dust by lazy writing and lackadaisical execution, Space Cowboys disappears into the black hole of unmet expectations.